The custom work I do includes barrel profiling to allow the use of longer or different calibre barrels to be used, barrel threading for sound moderator attachment, barrel crowning, jewelling of components (pics 1, 2, 3, 4), the valve body "O" ring mod, and recently breech work to convert the vertical cocking knob to a left or right hand side arrangement. If the standard barrel is replaced with a longer one, a new end cap is generally required. I make these in aluminium or black Delrin in various designs, with a small annulus clearance around the barrel. All my barrels are mirror polished after profiling to ensure minimal fictional losses in the working kinetic areas, which also aids shot consistency. The safety release can also be improved both aesthetically and in function. For this latter modification, the mechanism remains the same, but I replace the little red plastic tip with a brass blade. This looks and feels much nicer than the standard offering. The Stealth valve body/stem "O"ring was present on the very early valves, but later dropped in favour of a different style of seal on the underside of the top hat. This was cheaper and easier to manufacture, but wasn't a very good arrangement, as this only momentarily sealed the escaping air during the part of the air transfer phase when the tophat was in contact with the valve face. 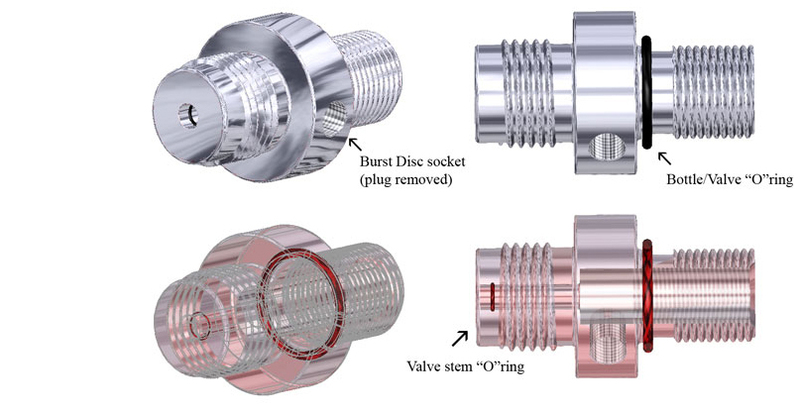 The "O"ring on the valve stem however, is much more efficient, as it gives a sliding seal, preventing air escape throughout the whole of the valve open-close cycle. Known as "The "O" ring mod." this is merely an undercut prepared in the valve body to retain a small captive "O"ring, as illustrated in the diagrams below. The valve stem then slides on this "O"ring, preventing air loss from the annulus between the outside of the stem and the valve body, during the short period that the valve is open. This quite dramatically improves valve function and efficiency, improving the valve stability and reducing the risk of valve dump. It gives you slightly more power output, as air that previously would have been wasted, now exits through the valve stem rather than around it. This quietens the valve very significantly, and if you reduce the valve stroke by Top-hat adjustment to accommodate this extra energy gain, will also give you more shots per charge or bottle fill. The reduced noise at the breech end during firing assists with shooter concentration improving your trigger and shot follow-through technique, and hence accuracy at the target. It is therefore one of the best mods you can do for this gun. In common with my longer style Top-hat which also raises the power output slightly, it is imperative you chronograph your gun after these modifications. I make a range of custom valve components, as shown in the diagram below, but don't supply the complete valve or valve body. This is a major modification to replace the top cocking knob with a side cocking arrangement. For this I mill a side slot in the frame to accept a new breech slide handle or knob. (This isn't ambidextrous like the standard arrangement, so needs to be user specified). The existing hole in the breech slide is filled with a stainless steel stud, which runs in the original slot. A new stainless steel handle is positioned at the side to run in the new slot, so the breech slide has guidance in two channels. Both the Stud and the side knob have undergone a redesign recently. The top Stud is now smaller and lighter, and the side knob now has a raised portion which mates with the new slot. After assembly this becomes captive in the slot which stops it being accidentally rotated in use. The extended base also resists twisting forces, giving better stability and strength. The side cocking arrangement is a very significant improvement and feels absolutely wonderful, particularly when used in conjunction with the cocking block I devised to compliment this. This aluminium block sits on the underside of the frame just rear of the forend, which needs a slight adjustment to accommodate it, and offers a position for the index finger to rest, allowing the breech slide to be cocked between thumb and forefinger. This now makes single-handed cocking a reality and is a very comfortable secondary position for carrying the gun.